and you got to have one. As you may have already known, unless you have been asleep for the past few months, the Starbucks Card, the most talked about card of today is here in the Philippines, to satisfy all our cravings for the freshest coffee concoction we can ever imagine. See what Starbucks Card is all about HERE. Guess what! Starbucks Philippines just loves The Food Alphabet's readers so much and are giving away Five (5) Starbucks Card pre-loaded with P300 each. 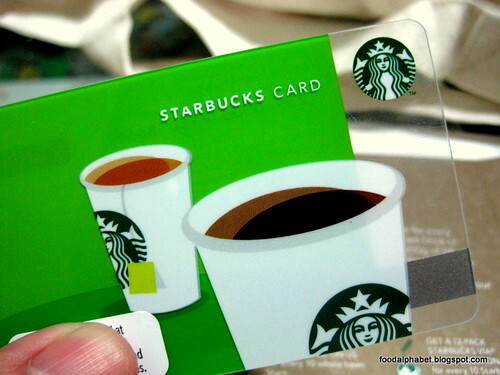 You would want to join this giveaway for other than getting the Starbucks Card with the P300 load, which you can choose to buy any Starbucks beverage, food or merchandise, you can even get another FREE Grande beverage of your choice when you register your card at https://starbuckscard.ph/SBCard. Also upon registering you will get a FREE Birthday treat on your birthday with any purchase of a Starbucks beverage. Plus, whenever you use your Starbucks Card for your purchases, you earn stars for you to exchange your stars for a FREE handcrafted beverage. So get going and join to start turning your visits into rewards. You can submit as much entries as you can! Remember that Rafflecopter will not determine the winner, it all depends on your photo entry. Winner's decision when posted is final. The winner's Starbucks Cards will be shipped by me directly to you. Good luck! Let's Krok it up at Krazy Garlik! Starbucks Card is here in the Philippines! The Starbucks Card arriving soon!